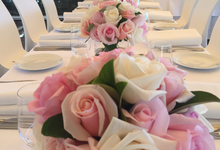 Yes We deliver to the bride, then the groom & deliver and set up all ceremony and reception flowers. Around 2 hours before the ceremony all bridal party flowers are delivered. Our flowers will last throughout the entire wedding, and most likely beyond. Time of year, types of flowers, and how open they are for the wedding will determine how long they last after the wedding day. We are very thorough and organised, it's just how we roll :) We have solid relationships with our growers and source only beautiful, fresh, premium quality flowers. It's your wedding day after all. 30% deposit. Final payment due 2 weeks prior to your wedding day. 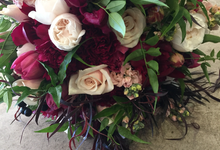 Creating exquisite wedding flowers is our absolute passion. We love that every wedding is different, every couple unique. Small, intimate weddings are so special, as are elaborate and grand celebrations. 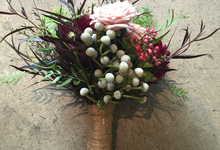 japonica will work with you to create truly beautiful, bespoke wedding flowers.